Sometimes the reading of one good book leads directly to another. The first of these I bought for my own Easter basket, the second was a library book that had almost reached its due date. 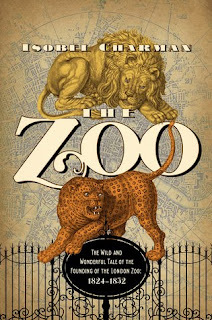 The Zoo: The Wild and Wonderful Tale of the Founding of London Zoo: 1826-1851 by Isobel Charman is just what it says in the subtitle, the story of the founding of the Zoological Society of London and, in turn, the first days of the London Zoo. I'm not sure I've mentioned this much here but my bachelor's degree is in zoology and I did two projects with many hours of observation on captive animals (sea otters!) before getting my degree. 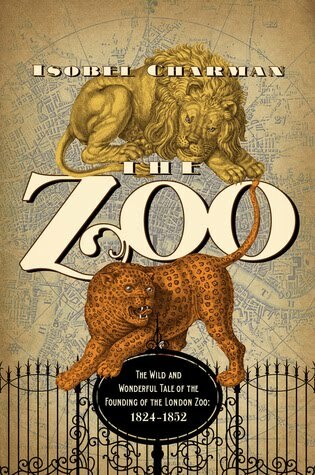 Zoos and aquariums are near and dear to my heart (and absolutely necessary if they have a conservation mission) as is Victorian London so this book couldn't have been more up my alley. It was definitely a tough read at times because of the lack of knowledge of how to properly house and care for wild animals and also their incompatibility with London's filthy air and chilly climate. This was balanced, though, by the work of some good men who truly cared and wanted to learn about the creatures they were charged with looking after. Each chapter is written to focus on a specific man and to highlight his contribution to the zoo, be he a visionary, an architect, or an Earl. What led me to crave my next read was the chapter on Darwin, whose voyage on The Beagle and return with samples and ideas coincided with some of the first years of the zoo. That night [Thoreau] wrote nothing about the world beyond Concord's woods--a world that seemed increasingly on the edge of combustion, too. A few months earlier he had been utterly consumed by the John Brown affair, unable to sleep, angry, and aflame with indignation. During the winter he had willed himself to quit thinking about the nation's baleful state of affairs, its compromises and hypocrisies, its unacceptable complicity with slavery. With little faith in the political process, which he believed favored the wealthy and self-interested, Thoreau read about the upcoming Republican and Democratic conventions with derision. Darwin's book had helped him take his mind off these things. The Origin had redirected his thinking. It shifted his focus from a corrupt society that seemed incapable of reform to a natural world defined entirely by change and exuberant dynamism. In his journals and conversations, Thoreau still sometimes erupted in anger at Brown's unjust execution. But Darwin's theory soothed him during this period. While reading this, I felt relieved that my feelings of late were not irrational but heartbroken that our country has yet to become the "more perfect union" that the founders envisioned. It also reminded me that regular distractions from politics are essential for good health and that a simple one can be found in any good book. Wow--that passage made my eyes well with tears. For just the reasons you went on to mention. I had no idea your degree was in zoology! How did that never come up!?!? Also, SEA OTTERS. We must talk in detail about this! Oh, very interesting books. I really need to read more non-fiction. I enjoy it, but somehow it's never a priority when I'm looking for books to read. 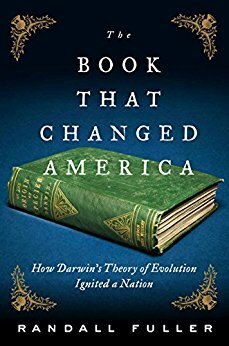 The one about Darwin and the New England intelligentsia (not sure if that's exactly the right word, but I like it so I'm using it!) seems remarkably topical. Where is our intelligentsia now? (TED talks, maybe??) Let's hear it for reasoned, thoughtful discourse! 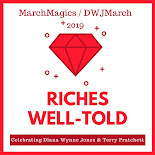 I am very picky about non-fiction books because if they're not great then I read tiny bits but never make any real progress and feel bad and, well, that's not a reading experience I want! I was curious about that too! You kind of take for granted how professional they are now but there was a time when the zoo veterinarians and keepers had never even seen most of the animals that they were all of a sudden in charge of. And, of course, there were no women involved at all. The zoo book sounds really interesting! I read a book a few years ago about zoos in modern America (and a little bit internationally, but mostly it was about the US), and it taught me a ton about how zoos work. It'd be neat to read more about zoo history and how they ran zoos before, like, animal rights were a thing. I need to read more about zoos. And yes, the animal rights thing was SUPER non-existent at this time. One bear was hurt by visiting ladies poking him in the face with their parasols and the chimpanzees were exhibited wearing sailor suits. Lordy.